The ocean has a powerful draw for all of us. Whether it evokes in us a desire for adventure—to set sail to new lands beyond the horizon—or whether it reminds us of holidays and lazy days on the beach with the sand between our toes, it has the power to touch both the heart and the imagination. Whether you leave near the coast, and want to pay homage to the ocean on your doorstep inside your home, or just want to bring a little bit of the seaside into an inland life, it's worth remembering that a 'maritime' or 'nautical' theme doesn't have to be a jumble of clichés—seashells, driftwood tables and stripes on every surface. 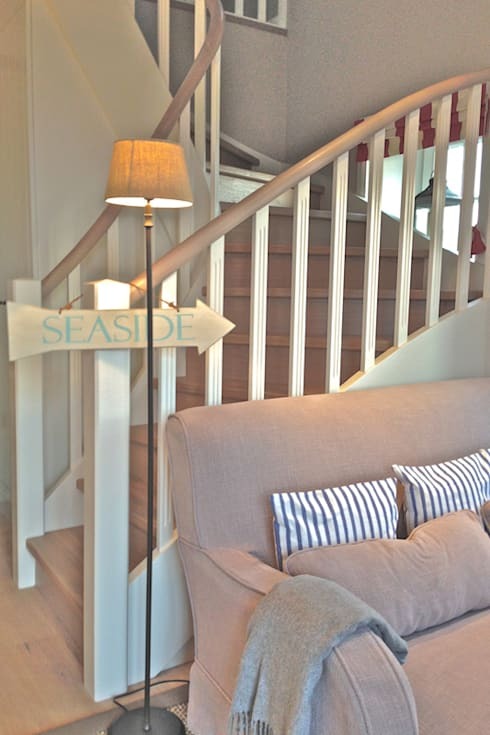 Subtle and understated touches, or modern twists on the theme will bring the seaside inside your door without going overboard (pardon the pun!). Browse below for inspiration. Originally introduced in 1858 as the uniform for the French navy, the Breton stripe is a classic of maritime themes. Inspired by inspired by sailors’ uniforms, Coco Chanel incorporated the stripes into her 1917 nautical collection, and an icon was born. If all you want is a little salty tang of the maritime in your interior, the breton stripe will add it—consider a striped throw, cushions, or curtains. 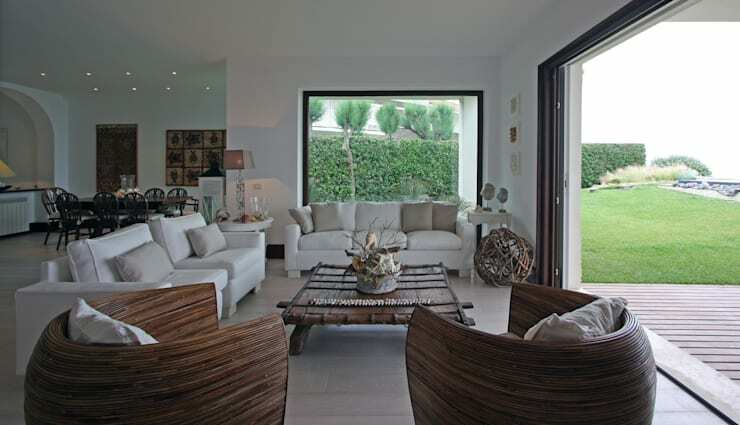 A clean and modern take on maritime; not a stick of driftwood or seashell in sight. Dark and light blue stripes nod to the Breton while paintings of the ocean pick up the theme. Light blue is refreshing and a reminder of the brisk fresh air of the coast. While blue is the colour for a maritime theme, off-white will also give that rustic, beachy feel, as long as the accessories are right. 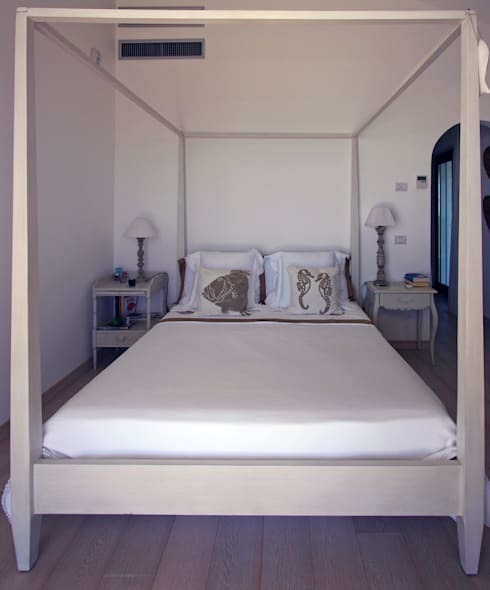 We love the mismatched bed tables and lamps—evocative as they are of lucky beach-combing finds. The grouper and seahorse printed cushions are fabulously maritime without being twee, and remind us that a maritime theme doesn't have to mean stripes and seashells. 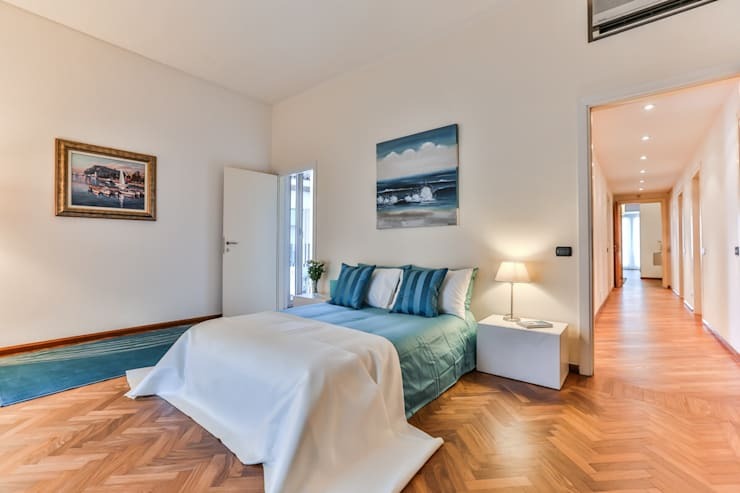 Eschewing blue in favour of off-white and dark brown, this home on Italy's Costa Laziale is a classy take on a maritime theme. The top of the teak coffee table is reminiscent of a flattened barrel, with the straps running horizontally across, while the legs have the rough-hewn quality of drift-wood. Shells and other beach finds make a fine centrepiece, while the barrel theme is picked up again in the curved armchairs. Coastal loveliness in a traditional style, but with none of the stereotypical 'Ahoy there sailor' cliches. 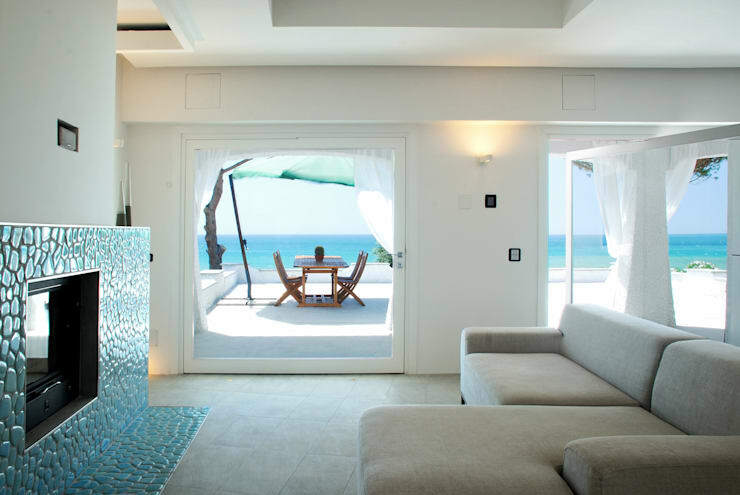 Blue pebble tiles flowing from wall to floor pick up and bring indoors the vibrant blue of the ocean outside this Santa Marinella home. If you're not lucky enough to have the ocean outside your door, you can still recreate its colours and textures indoors, and remember the the roar of the waves and the feel of stones rubbed smooth by the water, whether with a fireplace like this one, or by creating a similar tiled effect in your bathroom. This interior design project by GR8 Design is called 'Long Island Feeling' and succeeds in giving that maritime feel with a retro, 1950s twist. Again, it shows that 'maritime' encapsulates much more than just stripes, shells and driftwood, and can be inspired by beaches anywhere from the Hamptons in New York to the Visayas in the Philippines to Cornwall in the UK. 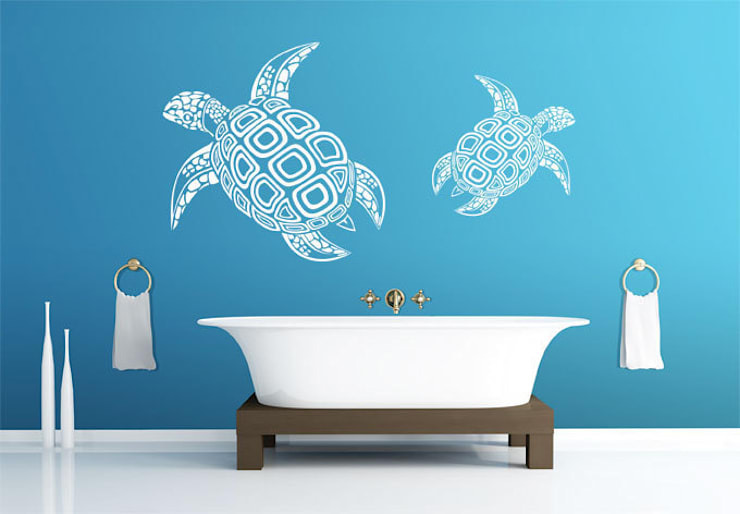 A great take on a maritime theme—the classic white and blue palette enlivened with wall tattoos of sea turtles. While maritime themes often reference European styles—the French Breton stripe, or the navy blue of the British navy—there's no reason it should be restricted to those styles. Exotic turtles evoke balmy tropical waters and lazy, happy days on the beach; the ocean is global, the style should be too. While we've focussed on more restrained and varied iterations of a maritime or nautical theme throughout this piece, we'll finish up with something rather more unabashed. 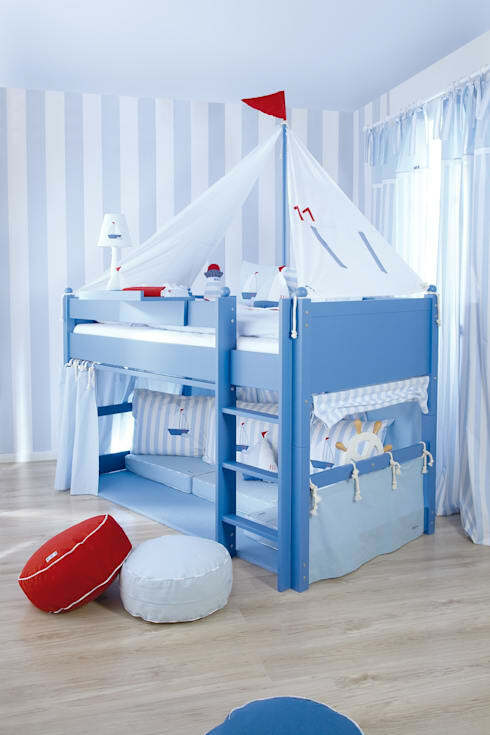 If you have a little sailor in your life, a kids bedroom is one place where you can throw caution and restraint to the wind, and pile on the stripes, sails, rope and the rest to your heart's content. Ahoy there sailor!